While the Union government plans to restructure the Food Corporation of India (FCI), agriculture scientists and nutrition experts are recommending that effective millet management should be included in the Public Distribution System (PDS) of the country. The step is important to achieve the food and nutrition security for the small and marginal tribal farming communities, they say. Recently, the ministry of consumer affairs, food and public distribution constituted a committee to restructure FCI in order to put a check on high cost and high wastage in food procurement and its distribution to consumers. One of the mandates of the committee is to suggest ways to make PDS, a scheme through which FCI procures grains from the farmers and distributes them to consumers at subsidised prices, more affective. In a national level consultation on 'New Opportunities for Nutritious Foods and Climate Smart Agriculture' in New Delhi on August 21, agriculture and nutrition experts from various parts of the country recommended that PDS policies should be more focused on alleviating poverty and malnutrition among the small-holder and family farmers. One of the ways to do that is to promote effective procurement and distribution of millets in the PDS, argued the participants. 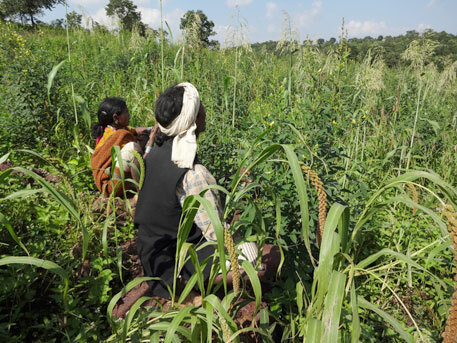 "Minor Millets are nutritionally rich and climate-smart and therefore should be given the focus they deserve. In the Public Distribution System (PDS), as per the new Food Security Act, passed by Parliament, millets are priced at Re 1, compared to wheat at Rs 2 and rice at Rs 3 in the PDS. However, this has not been institutionalised in the PDS system and no procurement is happening for millets and no MSP has been fixed, unlike in the case of rice and wheat where procurement mechanisms are in place,” said Ajay Parida, Executive Director, M S Swaminathan Research Foundation (MSSRF). “PDS being the single largest mechanism to reach the most-at-need vulnerable populations, it is essential to put in place mechanisms for production, procurement and distribution of millets to help the nation move towards nutrition security. In addition, the inclusion of millets in the Mid-Day-Meal and the ICDS would help increase the nutritive value of the dietary intake of the groups that these schemes reach," added Parida. In terms of nutrients such as proteins, fiber, minerals or micro-nutrients, millets have been proven to be better than wheat and rice. Besides, they need less water to grow and can provide high productivity even in the difficult climatic conditions. While the government claims to be promoting millets under the Food Security Mission, there still a lot needs to be done. J S Sandhu, agriculture commissioner with government of India, agreed: “In spite of the prediction of deficit monsoon, the area under cultivation of millets is declining,” he said. The consultation was organised by MSSRF in which various researchers, public policy advocates, government agencies and non-profits shared the knowledge and experiences of promoting sustainable agricultural practices that helped small-holder and family farmers move towards food and nutritional security. The consultation demanded that the government should ensure access to appropriate seeds for farmers for the home gardens through PDS and provide financial and other support to them for nutritious underutilised crops. SIFS aims to mobilise existing government programmes to provide support to small and marginal farmers for integrating traditional and sustainable agricultural practices along with agro-forestry, common land regeneration and livestock management. “Sixty to 65 per cent of the agriculture land in India is rainfed. With climate change the productivity of such land is going down and down. Millets are climate resilient and need less water. If millets are promoted under PDS, the utility of land will grow manyfold,” added Das. When we were asked on the inclusion minor millets in PDS system, we told them by simply putting in to PDS will not solve the problem but there must be some safegaurds such as unless you buy certaiin amount of minor millets, rice and wheat will not be sold. But the food security bill only put minor millets in PDS and did not considered the later part of our suggestion. As we all know the wheat and rice lobby at huge government subsidy produce and put in to FCI - PDS system while minor millets are mainly grown under rainfed condition without much subsidized fertilizers. Because of this we suggested to government give direct subsidy amount on fertilizers to farmers instead of industry. This was agreed by the government and thus taken up Aadhar card. But here again government failed to allow the farmers to use that subsidy to non-chemical fertilizers -- organic inputs. So, government is looking at providing help to rich at the cost of poor. This must change. This is a welcome move by the agricultural and scientific community. By recognizing the diversity of food habits and promoting indigenous food, one is catering to the needs of different groups and communities as well as re-instituting food crops that are of nutritional value and sustainable for small farmers. Great appreciation on the efforts taken on including the Minor millets into the Public Distribution System. Just taking to the PDS will not solve the food and nutrition problem in the country, unless the constant efforts put in educating the young minds at the schools and the common people at nation wide about the millets. Small farmers cultivating millets should be given more subsidies at different levels to increase more production, if possible direct procurement by the Govt for sustainability. To reach all age groups Govt can take up of opening the Nutri Food Stalls at nation wide at experiment basis following the Tamil Nadu model.